Wharton's Peter Conti-Brown and Philip Joyce of the University of Maryland discuss the idea of government being run as a business. Knowledge@Wharton: I’ll throw the hard question out there first. Can you run the government like a business? Philip Joyce: Well, I don’t think you can just decide that if you were a successful business executive that all of the things that you did are necessarily transferable to the government sector. And I think if you attempt to run government precisely like a business, then you’re going to find yourself relatively frustrated. Peter Conti-Brown: I agree. I think that the instinct to want to have market structures, incentive-based compensation, command-and-control approaches to government as we see in business can come from anyone who’s gone and spent too much time at the DMV. It’s like, “Oh, this is miserable. If this were privately run, this would be very different.” But virtually nothing about the architecture of government, in the United States or in other places, corresponds to that model. Your interactions with Congress, your interactions with the public, with foreign countries, the entire fiscal dynamic, budgetary dynamics differ widely between public sector and private sector. To anyone who simply says, “Oh, this is an easy problem to which there’s an easy solution — just hire a CEO,” has not grasped the nature of either problem or solution. Knowledge@Wharton: So, does it need to be a mix? It feels like there are certain elements that you can take a business approach to, but it can’t be a 100%, all-in philosophy. Joyce: Right. It’s interesting that Peter cites the DMV because the DMV in many places has been quite focused on trying to [improve] customer service. They’ve been trying to do things like, open at times when people are not working, as opposed to when they are working, and have people move more efficiently through systems. I think that’s the kind of thing that may be amenable to some kind of private-sector techniques. Governments also do things that are similar in some cases. They run utility companies. In some states they sell liquor. All of those things we think could be amenable to practices from the private sector. But there are lots of things that governments do because private firms would not do them and because they would not find it profitable to do them. If I’m the postal service, it’s actually not profitable for me or efficient for me to deliver mail to far-flung places, but I have to do it anyway. A private firm would not do that or would figure out how to charge a price that would be sufficient to recoup their costs. Government as the provider of last resort has to do a lot of things that private firms either can’t or would not do. Knowledge@Wharton: Government is looking out for the concerns and welfare of millions of citizens, whereas businesses are focused on the bottom line and being the best company financially that they could be. Joyce: Right, and they should be. Businesses operate in the interest of the people who buy and sell things with them and the interests of their shareholders. But the shareholders of the United States government are all of the citizens, and we can’t simply decide that we want to ignore some of them. Conti-Brown: That’s right. You can break this question into a lot of different pieces. One is philosophical concerns. There have been motivated debates about what government is or should be for centuries. On one hand, people would think [any government action is] coercion. On the other hand, it’s just the name that we give to the work that we do together. That’s a big philosophical, ideological difference. Another is just what is competence, what is successful management? The DMV examples, other kinds of examples, how do we motivate public employees? Can you do it in a way that is similar to motivations used by private firms? Do you have to have more public de-unionization in order to make that effective? Those kinds of debates, I think, are appropriately more in the weeds, more technical. Anyone who viscerally resists the idea that you can use insights from organizational behavior, and private management, and apply them to government is also missing the mark. But the question is where are we going? At the big ideological level, to simply equate the provision of services and say that anytime it is done by the public sector it is going to be inefficient or corrupt is, again, too simple. Joyce: I’m really glad that Peter raised this point. I think people conflate how well government operates with the question of whether they think government should do something or not. And the question of whether government should do something or not is basically a political question. The question that really we should be confronting is, once we have decided that government is going to do something, how can we set it up so that it does it most effectively? That’s completely separate from the question of whether you believe the government should be in the business of supporting the arts or subsidizing Amtrak or anything else, where there are perfectly reasonable debates on both sides about whether something is an appropriate role for government or not. Conti-Brown: Philip’s point here is so key. Because of that conflation, what we have is a rerun of the existential debates anytime we have a discussion about competence and strategy. As a historian, I can say this is something that has just come up time and time again. The 1928 election, for example, was seen very much as an election of competence. It was a question about Herbert Hoover, who was seen as this great businessman, great bureaucrat from previous administrations in the private and public sector, who had delivered food and relieved the great famine after World War I. It was the rise of competence. Hoover, interestingly in 1960, helped to devise strategies about how to make government more efficient. We saw this was Al Gore’s pet project after the 1992 election as vice president. The idea of trying to make government more streamlined by bringing insights from business is a very old one. But again, as Philip points out, because people fail to distinguish between those two questions, we just have the same relatively tired debates about whether government should be in a business at all, even though that’s not the question that’s there. No one is saying, “Take government out of the provision of Medicare, of health care completely.” But the debates about how the government should do it become a fight about that. And it can be very frustrating. Knowledge@Wharton: In terms of changes in philosophy, what needs to occur? Going into this new administration, one of the key words that has been bandied about is deregulation. Joyce: One of the things that we need to understand is that regulations exist for a reason. And those reasons have to do with implementing particular policies or laws that have been passed by Congress. To the question of whether we should have fewer regulations, we should go back to the question of what the regulations are there to accomplish. If, for example, we think we have too many environmental regulations, that goes back to laws that have been passed that led to those environmental regulations. It’s back to the point we were making earlier. If we want to have a debate about whether that’s a reasonable thing for government to do, that’s a reasonable debate to have. But once that we have decided government is going to do that, then it’s not a particular surprise that it results in regulations. Conti-Brown: Yes, there’s something about this deregulatory phenomenon that is so interesting in its rhetorical strategy. The field that I know best is financial regulation. Deregulation is rarely the elimination of regulation and much more often the replacement of regulation. So, a re-regulation. Often, that re-regulation is just oriented toward a different coalition. It’s not quite as clean as this, but sometimes regulation that occurs is seen as more hostile to industry. A deregulatory movement is a re-regulatory orientation toward industry. But that’s a very important idea. It’s not seen as we want to eliminate regulation, we want to reduce regulation. That has rarely, if ever, occurred in our national history. It’s much more about rewriting regulations and moving them in a different place. Those regulatory strategies can bring out the worst of business. Business isn’t simply about fierce competitors in the marketplace fighting for supremacy, and the best and brightest and most successful will win. Sometimes it’s about cozy relationships. Sometimes it’s about increasing barriers to entry for your competitors. Sometimes it’s about dirty tricks, savage ploys. And the problem is that government can function in a very similar way. There have been Nobel Prizes awarded for the basic economic insight that people in the marketplace will use government to their ends and will seek to capture from that mechanism in order to make their business interests more protected. Hence the world of the lobbyist and the extraordinary outlay of resources by industry in order to guide both regulatory and legislative processes. There are a number of things at play there, but one of them is to understand that it is a rhetorical strategy to say, and Democrats and Republicans alike have done this, “We’re going to pull regulations back and liberate industry.” Very often what happens instead is that we’re going to change the orientation of regulation. Citizens should be very wary to note how that orientation change occurs, who benefits and who doesn’t. Knowledge@Wharton: I read a statement recently that government, unlike business, has a harder time reshaping itself. Do you agree with that? Joyce: Absolutely. There’s a famous political scientist, Aaron Wildavsky, who studied the federal budget process. His key insight was that the best predictor of next year’s budget is this year’s budget. What happens in government is that we have developed a consensus around a particular allocation of resources in a particular year. Absent some major event that changes that, you’re not going to see a huge shift from one year to another. All of those coalitions that grew up around whatever that consensus was last year, by and large, they’re still there. It’s very difficult to make changes. In fact, that goes back to our constitutional structure. I like to remind my students that our system of government was not set up to promote change. It was not set up to promote good things happening. It was set up to prevent bad things from happening. This idea that we as a country are behind, which is the idea of checks and balances, the flip side of checks and balances is gridlock. People say gridlock when there’s a change that they wanted to see made and it wasn’t made. But they said checks and balances when the change is something that they don’t really agree with. So, it is very difficult to get things done. There is a sort of common belief out there that because we have the machine of government now completely under the control of the Republican party, that means that they’re going to be able to get anything done they want to. And it’s not quite that simple. Conti-Brown: I completely agree with Philip’s description of it. It’s question-begging, in a sense. Is this a good system? Many other governmental systems watching the U.S. constitutional structure — its tripartite division of power and a bicameral legislative basis with significant congressional and presidential skirmishes around a variety of different policies — have taken a close look and said, “That’s not for us,” and have opted instead for parliamentary systems where legislative and executive are much closer aligned. The political science literature on this is not clear about which systems empirically are better. That’s hard to measure. Our sample size is relatively restricted and makes it difficult to make apples-to-apples comparisons. But those who would celebrate the U.S. Constitution, which is basically every politician ever, needs to take a step back and say, “Well, this checks and balances gridlock thing, it produces certain kinds of outcomes. Are those the best kinds of outcomes? And is an ultimate democratic check and balance of regular elections efficient to guide a national system towards different kinds of goals?” That’s a hard question to answer. I’m not saying that the constitutional system is a bad one or an inferior one; I’m just saying that’s a question that we shouldn’t take for granted when we’re celebrating the very unusual design of the U.S. government. Joyce: It does go back to the precise question that we started with, which is the question of running government like a business. Let’s imagine that you’re somebody moving into a cabinet department to run it. You are going to be managing in the system we have. And the system we have is a system where there’s all this fragmentation of power, where it’s not a hierarchy, where you don’t have control over your budgetary resources or even knowledge of what your budgetary resources are. The federal government is right now operating under a continuing resolution, which is a short-term appropriation that expires at the end of April. At the end of April, that will be seven months into the fiscal year. They have no idea what changes President-elect Trump and the Republican Congress are going to make to their budgets. Imagine a business executive that was trying to operate in an environment like that where there was not only uncertainty about what your resources were going to be next year or the year after, but not even any certainty about what the resources were that you were going to have in the fiscal year that you are currently in. Knowledge@Wharton: But that’s something that most people getting into government have to realize. That’s the way it’s been forever and the way it’s going to be forever. Some of the core things about how government run are not going to change in our lifetimes. Joyce: The lesson I would take from this is, rather than thinking that you’re going to bring people in from the private sector, and somehow because you’re bringing them in from the private sector, everything about the way the government operates is going to change, you should ask: What are the self-inflicted wounds about the operation of government right now that is preventing it from operating in an optimal fashion? This is my own hobby horse because I’ve written about this. To me, when members of Congress decry the inefficiency of government, but only four times in the last 41 years have they been able to pass appropriation bills on time, I would suggest they look in the mirror before they start pointing to why it is that government agencies don’t operate efficiently. Conti-Brown: When we talk about government as a singular, it’s important to remember the way that citizens perceive governmental failure is talking about a multitude of interactions on the municipal, state and federal level. If we’re talking about the federal level, it’s in a variety of different contexts. If you’re a Louisiana fisherman and the EPA has limited your ability to navigate wetlands or something like that, then your beef with government is going to be very specific. It might have something to do with legislation passed in 1970, right? Where there’s not discretion really being exercised. It’s very clear you’re in plain, straightforward violation of law in a way that is harming us all. It’s a way that when you’re angry at the government for limiting your freedom, what you’re actually seeing is you are polluting the watershed in a way that hurts the rest of us. Conflating all those concerns, which is just what happens in a democratic process, we don’t have individual referenda on each individual policy. Thank God for that. But because we don’t, all of that gets swirled together in a common ideology when the problems have virtually nothing to do with each other and sometimes aren’t even problems. That makes it really hard to navigate. Joyce: Let’s just look at the federal government for a second. If you were to add up the costs of Social Security, Medicare and the defense budget, you’re accounting at that point for two-thirds or more of the federal budget. Those are three things that are actually quite popular. Those are three things that citizens actually think the government should be doing and, by and large, think that the government does well. So, we also can’t paint government with this sort of broad brush as if the citizenry is opposed to all things that government does or thinks that everything that government does are done badly, because there’s a lot of things that government does that have quite a bit of support from the citizens or where citizens think that government does it pretty well. Knowledge@Wharton: If you’re correlating taxpayers to shareholders, how closely aligned are they? Joyce: I am a small shareholder in a few corporations, and I don’t think I have much say at all because I’m not one of the big shareholders, right? We do not have a system of government where we make decisions based on some big town-hall meeting that we all have. We have representative government. The way that taxpayers are able to influence government is through their elected officials and through interest groups that influence their elected officials. The capacity for an individual taxpayer, unless they’re somebody who has a lot of clout and gives a lot of campaign contributions, is probably not all that great. But I would argue that an individual shareholder, unless they’re a major shareholder, probably doesn’t have that much influence either. Conti-Brown: Right. I think that the shareholder/taxpayer parallel breaks down pretty quickly under scrutiny in part because of these kinds of issues that Philip is identifying. I’m also a shareholder in thousands of corporations, and the organization that represents my interest is a large shareholder, sometimes the largest, because I have index funds. So, Vanguard is representing my interest to these companies, and Vanguard doesn’t really represent those interests because they’re invested in everything, right? They’ll vote proxies, etc. But again, they’re looking at the market systemwide. The better analogy perhaps might be voter as opposed to taxpayer. Taxpaying is a phenomenon, and the tax system is riddled with all kinds of exceptions, exemptions, loopholes, different maneuvers and that kind of thing. Tax policy has become social policy in an extraordinary extent. But for citizen voters, and sometimes even citizen nonvoters, the key there in influencing government is by capturing the public attention and then making our representatives within that government make your cause their own. THE winds of the Oklahoma panhandle have a bad reputation. In the 1930s they whipped its over-tilled topsoil up into the billowing black blizzards of the Dust Bowl. The winds drove people, Steinbeck’s dispossessed, away from their livelihoods and west, to California. Today, the panhandle’s steady winds are a force for creation, not destruction. Wind turbines can generate electricity from them at rock-bottom prices. Unfortunately, the local electrical grid does not serve enough people to match this potential supply. The towns and cities which could use it are far away. So Oklahoma’s wind electricity is to be exported. Later this year, lawsuits permitting, work will begin on a special cable, 1,100km (700 miles) long, between the panhandle and the western tip of Tennessee. There, it will connect with the Tennessee Valley Authority and its 9m electricity customers. The Plains and Eastern Line, as it is to be known, will carry 4,000MW. That is almost enough electricity to power Greater London. It will do so using direct current (DC), rather than the alternating current (AC) that electricity grids usually employ. And it will run at a higher voltage than such grids use—600,000 volts, rather than 400,000. This long-distance ultra-high-voltage direct-current (UHVDC) connector will be the first of its kind in America. But the problem it helps with is pressing everywhere. Fossil fuels can be carried to power stations far from mines and wells, if necessary, but where wind, solar and hydroelectric power are generated is not negotiable. And even though fossil fuels can be moved, doing so is not desirable. Coal, in particular, is costly to transport. It is better to burn it at the pithead and transport the electricity thus generated instead. Transmitting power over thousands of kilometres, though, requires a different sort of technology from the AC now used to transmit it tens or hundreds of kilometres through local grids. And in China, Europe and Brazil, as well as in Oklahoma, a new kind of electrical infrastructure is being built to do this. Some refer to the results as DC “supergrids”. AC’s ubiquity dates from the so-called “war of the currents” that accompanied electrification in the 1880s and 1890s. When electricity flows down a line as AC, energy travels as a wave. When it flows as direct current, there is no oscillation. Both work well, but the deciding factor in AC’s favour in the 19th century was the transformer. This allows AC voltages to be increased after generation, for more efficient transmission over longish distances, and then decreased again at the other end of the line, to supply customers’ homes and businesses. At the time, direct current had had no such breakthrough. When one eventually came, in the 1920s, in the form of the mercury arc valve, AC was entrenched. Even the solid-state thyristor, a cousin of the transistor invented in the 1950s, offered no great advantages over the tens or hundreds of kilometres that power grids tended to span. Some high-voltage DC lines were built, such as that under the English Channel, linking Britain and France. But these were justified by special circumstances. In the case of the Channel link, for example, running an AC line through water creates electromagnetic interactions that dissipate a lot of power. Over transcontinental distances the balance of advantage shifts. As voltages go up, to push the current farther, AC employs (and thus wastes) an ever-increasing amount of energy in the task of squeezing its alternations through the line. Direct current does not have this problem. Long-distance DC electrical lines are also cheaper to build. In particular, the footprint of their pylons is smaller, because each DC cable can carry far more power than an equivalent AC cable. Admittedly, thyristors are expensive—the thyristor-packed converter stations that raise and lower the voltage of the Plains and Eastern line will cost about $1bn, which is two-fifths of the project’s total bill. But the ultra-high voltages required for transcontinental transmission are still best achieved with direct current. For all the excitement surrounding the Plains and Eastern Line, however, America is a Johnny-come-lately to the world of UHVDC. Asian countries are way ahead—China in particular. As the map on the previous page shows, the construction of UHVDC lines is booming there. That boom is driven by geography. Three-quarters of China’s coal is in the far north and north-west of the country. Four-fifths of its hydroelectric power is in the south-west. Most of the country’s people, though, are in the east, 2,000km or more from these sources of energy. China’s use of UHVDC began in 2010, with the completion of an 800,000-volt line from Xiangjiaba dam, in Yunnan province, to Shanghai. This has a capacity of 6,400MW (equivalent to the average power consumption of Romania). The Jinping-Sunan line, completed in 2013, carries 7,200MW from hydroelectric plants on the Yalong river in Sichuan province to Jiangsu province on the coast. The largest connector under construction, the Changji-Guquan link, will carry 12,000MW (half the average power use of Spain) over 3,400km, from the coal- and wind-rich region of Xinjiang, in the far north-west, to Anhui province in the east. This journey is so long that it requires 1.1m volts to push the current to its destination. 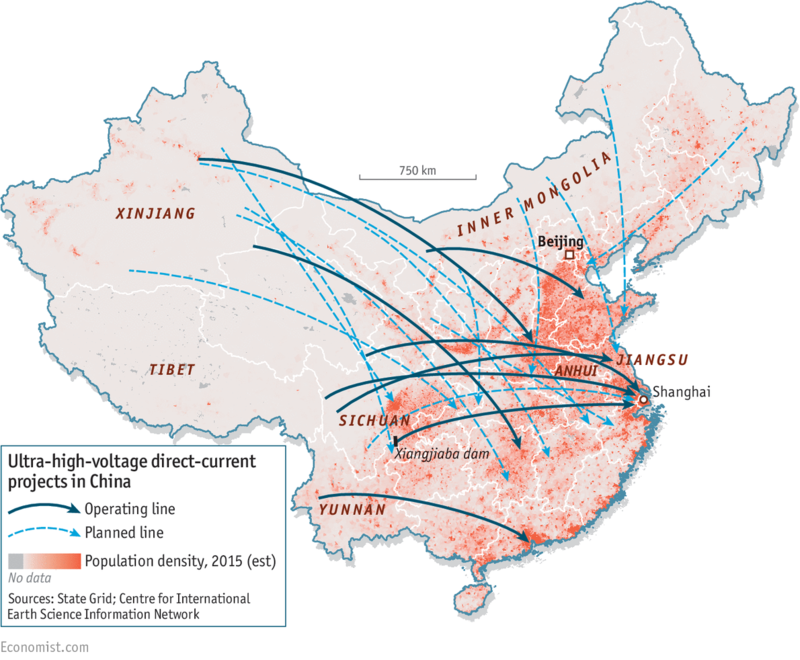 China’s UHVDC boom has been so successful that State Grid, the country’s monopolistic electricity utility, which is behind it, has started building elsewhere. In 2015 State Grid won a contract to build a 2,500km line in Brazil, from the Belo Monte hydropower plant on the Xingu River, a tributary of the Amazon, to Rio de Janeiro. China’s neighbour India is following suit—though its lines are being built by European and American companies, namely ABB, Siemens and General Electric. The 1,700km North-East Agra link carries hydroelectric power from Assam to Uttar Pradesh, one of the country’s most densely populated areas. When finished, and operating at peak capacity, it will transmit 6,000MW. At existing levels of demand, that is enough for 90m Indians. The country’s other line, also 6,000MW, carries electricity 1,400km from coal-fired power stations near Champa, in Chhattisgarh, to Kurukshetra, in Haryana, passing Delhi on the way. Valuable though they are, transcontinental links like those in China, Brazil and India are not the only use for UHVDC. Electricity is not described as a “current” for nothing. It does behave quite a lot like a fluid—including fanning out through multiple channels if given the chance. This tendency to fan out is another reason it is hard to corral power over long distances through AC grids—for, being grids, they are made of multiple, interconnected lines. Despite UHVDC connectors being referred to as supergrids, they are rarely actual networks. Rather, they tend to be point-to-point links, from which fanning out is impossible. Some utilities are therefore looking at them to move power over relatively short distances, as well as longer ones. One such is 50Hertz, which operates the grid in north-east Germany. Almost half the power it ships comes from renewable sources, particularly wind. The firm would like to send much of this to Germany’s populous south, and on into Austria, but any extra power it puts into its own grid ends up spreading into the neighbouring Polish and Czech grids—to the annoyance of everyone. 50Hertz is getting around this with a new UHVDC line, commissioned in partnership with Germany’s other grid operators. This line, SuedOstLink, will plug into the Meitingen substation in Bavaria, replacing the power from decommissioned south-German nuclear plants. And Boris Schucht, 50Hertz’s boss, has bigger plans than that. He says that within ten years UHVDC will stretch from the north of Sweden down to Bavaria. After this, he foresees the development of a true UHVDC grid in Europe—one in which the lines actually interconnect with each other. That will require new technology—special circuit-breakers to isolate faulty cables, and new switch gear—to manage flows of current that are not simply running from A to B. But, if it can be achieved, it would make the use of renewable-energy sources much easier. When the wind blows strongly in Germany, but there is little demand for the electricity thus produced (at night, for instance), UHVDC lines could send it to Scandinavian hydroelectric plants, to pump water uphill above the turbines. That will store the electricity as potential energy, ready to be released when needed. Just as sources of renewable energy are often inconveniently located, so, too are the best energy-storage facilities. UHVDC permits generators and stores to be wired together, creating a network of renewable resources and hydroelectric “batteries”. In Asia, something similar may emerge on a grander scale. State Grid plans to have 23 point-to-point UHVDC links operating by 2030. But it wants to go bigger. In March 2016 it signed a memorandum of understanding with a Russian firm, Rosseti, a Japanese one, SoftBank, and a Korean one, KEPCO, agreeing to the long-term development of an Asian supergrid designed to move electricity from windswept Siberia to the megalopolis of Seoul. This project is reminiscent of a failed European one, Desertec, that had similar goals. But Desertec started from the top down, with the grand vision of exporting the Sahara’s near-limitless solar-power supply to Europe. Today’s ideas for Asian and European supergrids are driven by the real needs of grid operators. Such projects—which are transnational as well as transcontinental—carry risks beyond the merely technological. To outsource a significant proportion of your electricity generation to a neighbour is to invest huge trust in that neighbour’s political stability and good faith. The lack of such trust was, indeed, one reason Desertec failed. But if trust can be established, the benefits would be great. Earth’s wind-blasted and sun-scorched deserts can, if suitably wired up, provide humanity with a lot of clean, cheap power. The technology to do so is there. Whether the political will exists is the question. LONDON – Is the economics profession “in crisis”? Many policymakers, such as Andy Haldane, the Bank of England’s chief economist, believe that it is. Indeed, a decade ago, economists failed to see a massive storm on the horizon, until it culminated in the most destructive global financial crisis in nearly 80 years. More recently, they misjudged the immediate impact that the United Kingdom’s Brexit vote would have on its economy. Of course, the post-Brexit forecasts may not be entirely wrong, but only if we look at the long-term impact of the Brexit vote. True, some economists expected the UK economy to collapse during the post-referendum panic, whereas economic activity proved to be rather resilient, with GDP growth reaching some 2.1% in 2016. But now that British Prime Minister Theresa May has implied that she prefers a “hard” Brexit, a gloomy long-term prognosis is probably correct. Unfortunately, economists’ responsibility for the 2008 global financial crisis and the subsequent recession extends beyond forecasting mistakes. Many lent intellectual support to the excesses that precipitated it, and to the policy mistakes – particularly insistence on fiscal austerity and disregard for widening inequalities – that followed it. Some economists have been led astray by intellectual arrogance: the belief that they can always explain real-world complexity. Others have become entangled in methodological issues – “mistaking beauty for truth,” as Paul Krugman once observed – or have placed too much faith in human rationality and market efficiency. Despite its aspiration to the certainty of the natural sciences, economics is, and will remain, a social science. Economists systematically study objects that are embedded in wider social and political structures. Their method is based on observations, from which they discern patterns and infer other patterns and behaviors; but they can never attain the predictive success of, say, chemistry or physics. Human beings respond to new information in different ways, and adjust their behavior accordingly. Thus, economics cannot provide – nor should it claim to provide – definite insights into future trends and patterns. Economists can glimpse the future only by looking backwards, so their predictive power is limited to deducing probabilities on the basis of past events, not timeless laws. And because economics is a social science, it can readily be used to serve political and business interests. In the years leading up to the financial crisis, global economic growth and profits were so strong that everyone – from small investors to the largest banks – was blinded by the prospect of bigger gains. Economists employed by banks, hedge funds, and other businesses were expected to provide a short-term “view” for their employers and clients; and to dispense their “wisdom” to the general public through interviews and media appearances. Meanwhile, the economics profession was adopting more complex mathematical tools and specialized jargon, which effectively widened the gap between economists and other social scientists. Before the financial crisis, when so many private interests and profitable opportunities were at stake, many economists defended a growth model that was based more on “irrational exuberance” than on sound fundamentals. Similarly, with respect to Brexit, many economists confused the referendum’s long-term impact with its short-term effects, because they were rushing their predictions to fit the political debate. Where do we go from here? While we should appreciate Haldane’s candid admission, apologizing for past mistakes is not enough. Economists, especially those involved in policy debates, need to be held explicitly accountable for their professional behavior. Toward that end, they should bind themselves with a voluntary code of conduct. Above all, this code should recognize that economics is too complex to be reduced to sound bites and rushed conclusions. Economists should pay closer attention to when and where they offer their views, and to the possible implications of doing so. And they should always disclose their interests, so that proprietary analysis is not mistaken for an independent perspective. Moreover, economic debates would benefit from more voices. Economics is a vast discipline that comprises researchers and practitioners whose work spans macro and micro perspectives and theoretical and applied approaches. Like any other intellectual discipline, it produces excellent, good, and mediocre output. But the bulk of this research does not filter into policymaking and decision-making circles, such as finance ministries, central banks, or international institutions. At the commanding heights, economic-policy debates remain dominated by a relatively small group of white men from American universities and think tanks, nearly all of them well-versed devotees of mainstream economics. The views held by this coterie are disproportionately represented in the mass media, through commentaries and interviews. But fishing for ideas in such a small and shallow pond leads to a circular and complacent debate, and it may encourage lesser-known economists to tailor their research to fit in. The public deserves – and needs – a marketplace of ideas in which mainstream and heterodox views are afforded equal attention and balanced discussion. To be sure, this will take courage, imagination, and dynamism – particularly on the part of journalists. But a fairer, more pluralistic discussion of economic ideas may be just what economists need as well. High-profile, anti-euro, anti-immigration Marine Le Pen is unlikely to win the presidency. That’s good news for French stocks. After surprise populist electoral victories in the United Kingdom and the U.S. last year, the anti-euro, anti-immigrant National Front candidate Marine Le Pen, 48, could win the French presidency this spring, some investors fear. That prospect would depress a rallying French stock market and encourage capital flight. With at least five major candidates, however, it’s likely that voters will give the nod to the center-right Republican candidate François Fillon, a 62-year-old former prime minister with pro-business bona fides, at least by French standards. Fillon proposes, among other things, to cut civil-service jobs by about 10%, or 500,000, and make the highly regulated French workweek more flexible. He also wants to reduce taxes and government debt. His election would be positive for local stocks, at least at first. If, as is likely, no one wins an outright majority on April 23, the two with the most votes will vie in a second round on May 7. The leading candidates are Fillon, polling about 25% to 29% of the vote, and Le Pen, 23% to 25%. She has been softening her hard-right stance in an effort to pick up votes from the center right, but ultimately she wishes to remove France from the euro and sharply reduce its participation in the European Union. British and U.S. polls got it notoriously wrong last year because a few percentage points made a difference, Lichfield says. In France, “you’d have to be 20 points off” for a Le Pen win, he adds. In any runoff between the two, voters on the left will hold their noses and vote for the Republican, just as they did in 2002, notes Jean François Comte, co-president of Lutetia Capital, headquartered in Paris. “You still have 75% of the French people who find the far right unfit,” he says. In 2002, Republican Jacques Chirac defeated Jean-Marie Le Pen, the National Front founder (and father of Marine Le Pen), who surprised everyone by making it to the second round. The Socialists then urged their voters to switch to Chirac, who won in the runoff. Today, the French Socialists are again divided and weak. That’s partly why people fear Le Pen. The front-runner in that party is Manuel Valls, 54. He polls about 15% of the presidential vote and suffers from his connection as a former prime minister under current Socialist President François Holland, one of the most unpopular to hold that office. Hollande failed to reduce unemployment, now about 10%, and was unable to check terrorist attacks in the country. Another important candidate for the French presidency is Emmanuel Macron, 39, a center-left independent from his own party, En Marche. This former economics minister and investment banker has gained popularity recently. He’s polling about 14% to 18%, and some believe that he could dislodge Le Pen and make it to the second round against Fillon. That would be a pro-market scenario, too. Others include radical-left independent candidate Jean-Luc Mélenchon, 65. Polls have given him a double-digit percentage portion of the vote. THE FRENCH STOCK MARKET has rallied since the election of Donald J. Trump as U.S. president. 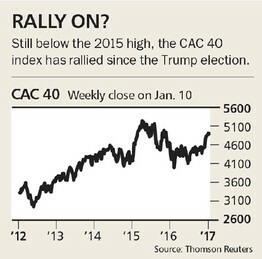 Even so, the CAC 40, at 4922, is below recent highs, and remains substantially below its 2007 and 2000 highs, unlike the Standard & Poor’s 500 index. A Fillon victory shouldn’t get investors overly excited. While he is the best candidate for France’s economy, Danny Van Quaethem, a Ghent, Belgium–based portfolio manager with Société Générale Private Banking, says the next French president will be constrained by a government budget deficit that is likely to be over 3% of gross domestic product and total government debt that is nearly 100% of GDP. Jean-Charles Mériaux, chief investment officer of DNCA Finance, concurs. But even if the “French Thatcher,” as Fillon is dubbed, “realizes only 50%” of what he wants to do, it would be good for the economy and for stocks. “With Le Pen, capital will flow out of France. Fillon would bring back capital,” he says. Mériaux says most French domestic stocks would benefit under Fillon. French consumer confidence is at a nine-year high, he points out. Auto industry stocks such as Renault (ticker: RNO.France) and MichelinML.FR in Your Value Your Change Short position (ML.France) could benefit, he says. So could energy giant TotalTOT in Your Value Your Change Short position (FP.France) and bank BNP Paribas P.FR in Your Value Your Change Short position (BNP.France). Another way to play the French market is the iShares MSCI France exchange-traded fund (EWQ). Audrey Kaplan, co-head of International equity at Federated Investors, says France looks more attractive than it did six months ago. Last June, just 25% of industry analysts were revising higher their 24 month forward-earnings forecasts for French stocks. Now, nearly 50% are. A lower euro helps, but it also suggests that analysts are more confident of growth. Broad economic measures have improved in Europe in general, also. “The European recovery is genuine,” she says. Predicting elections is a risky business, but the stars seem aligned for a Fillon victory—or at least a Le Pen loss. Editor's note: This weekend, we're sharing a must-read essay from Casey Research founder Doug Casey. Doug says the odds are high that the U.S. is going into a time of troubles "at least as bad as any experienced in any advanced country in the last century." “Making the chicken run” is what Rhodesians used to say about neighbors who packed up and got out during the ’60s and ’70s, before the place became Zimbabwe. It was considered “unpatriotic” to leave Rhodesia. But it was genuinely idiotic not to. I’m directing these comments toward the U.S. mainly because that’s where the problem is most acute, but they’re applicable to most countries. Now, in 2017, the U.S. is in real trouble. Not as bad as Rhodesia 40 years ago—and definitely a different kind of trouble—but plenty serious. For many years, it’s been obvious that the country was eventually going to hit the wall, and now the inevitable is rapidly becoming imminent. What do I mean by that? There’s plenty of reason to be concerned about things financial and economic. But I personally believe we haven't been bearish enough on the eventual social and political fallout from the Greater Depression. Nothing is certain, but the odds are high that the U.S. is going into a time of troubles at least as bad as any experienced in any advanced country in the last century. I hate saying things like that, if only because it sounds outrageous and inflammatory and can create a credibility gap. It invites arguments with people, and although I enjoy discussion, I dislike arguing. It strikes most people as outrageous because the long-running post-WWII boom has been punctuated only by brief recessions. After 70 years, why should it ever end? The thought of a nasty end certainly runs counter to the experience of almost everyone now alive—including myself—and our personal experience is what we tend to trust most. But it seems to me we're very close to a tipping point. Ice stays ice even while it’s being warmed—until the temperature goes over 32° F, where it changes very quickly into something very different. That point—economic bankruptcy accompanied by financial chaos—is quickly approaching for the U.S. government. With deficits over a trillion dollars per year for as far as the eye can see, the U.S. Treasury will very soon be unable to roll over its maturing debt at anything near current interest rates. The only reliable buyer will be the Federal Reserve, which can buy only by creating new dollars. Within the next 24 months, the dollar is likely to start losing value rapidly and noticeably. Foreigners, who own over 6 trillion of them (including T-bills and other IOUs), will start panicking to dump them. So will Americans. The dollar bond market, today worth $40 trillion, will be devastated by much higher interest rates, a rapidly depreciating dollar, and an epidemic of defaults. And that will be just the start of the trouble. Since the U.S. property market floats on a sea of debt (and is easy to tax), it’s also going to be hit very hard, again, this time by stifling mortgage rates. The next step is up for interest rates. Forget about property owners paying their existing mortgages; many won’t be able to pay their taxes and utilities, and maintenance will be out of the question. The pain will spread. Insurance companies are invested mostly in bonds and real estate; many will go bankrupt. The same is true of most pension funds. If the stock market doesn’t collapse, it will only be because money is looking for a place to hide from inflation. The payout for Social Security will drop significantly in real terms, if not in dollars. The standard of living of most Americans will fall. This rough sequence of events has happened in many countries in recent decades, and they’ve survived the tough times. But it has the potential, at least in relative terms, to be more serious in the U.S. than it was in Argentina, Brazil, Serbia, Russia, Mozambique, or Zimbabwe for two main reasons. First, many people in those countries knew they couldn’t trust their government and acted accordingly, even in contravention of the law, by accumulating assets elsewhere. So, there was a significant pool of capital available for rebuilding. Americans, on the other hand, tend to be much more insular, law-abiding, and trusting in their government. When they lose their U.S. assets, they'll have lost everything. Second, those societies were significantly more rural than the U.S. is today. As in the America of 100 years ago, much of the population lived quite close to the land and had practical skills and habits that helped them get through the tough times. For 21st-century Americans, it's a different story. Shortages and disorder are going to hit commuters who live in suburbs, and urban dwellers who think milk appears in cartons magically, like a ton of bricks. One thing you can absolutely count on is that everyone will look to the government to “do something.” Americans really do think governments control the way the world works. Another certainty is that the U.S. government will “step in” massively, because everyone will want them to, and the politicians themselves believe they should. This will greatly aggravate the crisis and make it last much longer than necessary. But that’s just over the short run. The long run is much more serious because the next chapter of the Greater Depression has every chance of radically, and at least semi-permanently, overturning the basic character of American life. Ice turned to water—suddenly and unexpectedly—in Russia in 1918, Germany in 1933, China in 1949, Vietnam in 1954, Cambodia in 1975, and Rwanda in 1995. Those are just the first examples that come to mind. There are scores more. The economic events I’ve outlined are going to mean serious hardship and unpleasantness for many people. But that doesn't concern me nearly as much as the social and political reaction.